A book review wouldn't be a true review if I wasn't honest with you. This book just really wasn't good. I know there were so many people who really enjoyed it, but I was not one of them. 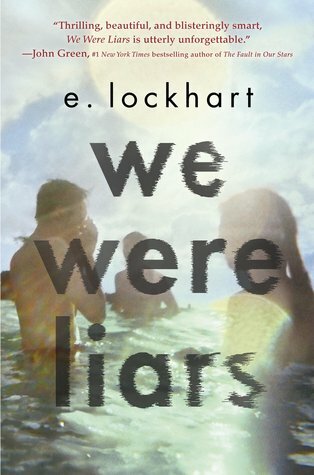 I think this novel could have had many different names... one of them being: We Were Stuck Up and Spoiled. The characters are pretentious, boring, and pretty one dimensional. I believe what makes a certain character likable is when a reader is able to relate to a character or wants to have some of the qualities of said character. I tried so hard to like the characters, I really really did. I just couldn't do it. They were just so stuck up and boring! It was impossible to find anything I had in common with them because I never really learned anything about their lives other than the fact they got together every summer at their family's ridiculous private island. The story starts out interesting and by the summary paragraph, you think its going to be some intense, action packed, twist filled book. Let me clear that up for you, its not. It is predictable and boring until the last couple of chapters when there is a small and unexpected plot twist. I didn't really see it coming... and it was a somewhat ("somewhat" being the key word) interesting change to the story, but it still wasn't enough to make me like the book. This novel had a lot of hype around it and it just really wasn't worth it to me. I really hate writing a bad review, and its actually much harder to do than writing a good review! In summary, a lot of people really loved this book, but it just wasn't for me. I wouldn't recommend this to a friend.